It might be an unpopular opinion here on ATS, but I don’t think the Earth is flat. I think that mine is a legitimate opinion based on observation, and dare I say it, science. It seems to me that flat-Earthers are the ones trying to cover up the truth, although I don’t think there is any danger of them taking over the world anytime soon. I think a lot of them believe the Earth is flat, and they are free to believe what they like I suppose. They could be holdovers from an earlier time. A long time ago, Christians thought our world was flat and that Earth was the center of the universe - even the sun orbited around us! This belief was common sense based on what was known at the time. When facts and science proved otherwise, it seemed threatening to those who thought it would threaten Order in the world. But luckily, society evolved. People who cling to the old beliefs that the world was flat feared change. But in reality, the best way to know God is through science and the accurate study of the universe He created. 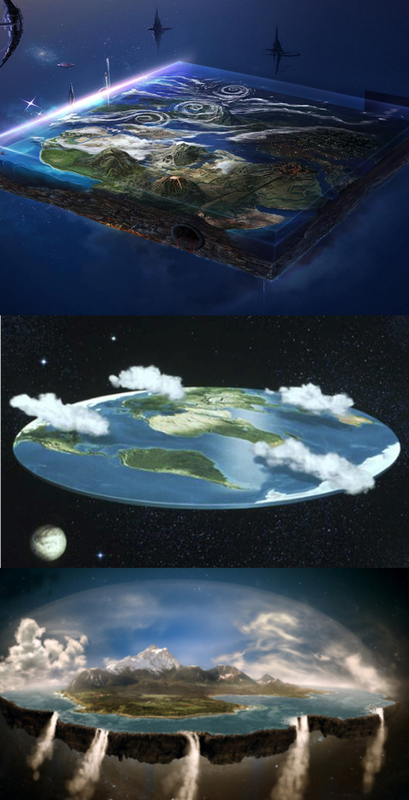 The Earth is not flat. If it is Gods creation, don’t you think he would want us to understand that? you have to be kidding me right? One question I would like answered by the flat earth crowd is what shape do they think the earth is? And what exactly is going to stop all of the oceans water from running off the side? The leading flat-earther theory holds that Earth is a disc with the Arctic Circle in the center and Antarctica, a 150-foot-tall wall of ice, around the rim. NASA employees, they say, guard this ice wall to prevent people from climbing over and falling off the disc. So we have a 150-foot-tall wall of ice at the edge of the world and not ONE single picture of it yet? Yep sure, it must be black ice that blends in with space, so we can't see it or photograph it. It is all about trying to picture how confined we as a species have always been ...and always will be. We are given the illusion to be free but reality is that we are controlled and steered. There is no indefinite space, there is no endless growth, there is no freedom.. we are given the illusion. I do not say it is so.... All I am asking is to IMAGINE this is our reality and what does it make you feel...think about the purpose of our excistance? Bit difficult I know but.. would it be worth the effort to feed us the lie. Why do you think "they" decided it is better to force feed us those lies? What would happen if they wouldn't...couldn't....or had not?